The OnePlus 6T McLaren Edition Speed Orange (yes, that’s the marketing name) is currently expected to go official next week. 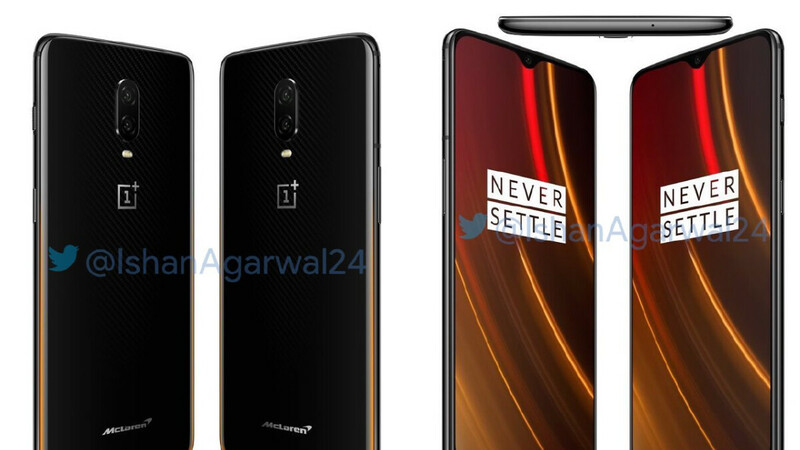 OnePlus itself has stayed quiet in regards to specs, but today a group of leaked marketing images has revealed both the design and some key characteristics. From the front, the McLaren Edition model looks set to be indistinguishable from the regular OnePlus 6T due to the presence of the same waterdrop notch and large display. However, over on the rear, it’s clear that OnePlus has made some pretty significant changes. Gone is the single-color panel that adorns the normal model and in its place is a new piece of glass that boasts a carbon fiber-like pattern underneath. This is combined with an orange hue that has been added to the bottom edge of the glass and extends to the sides. One final touch comes in the form of the McLaren logo. In regards to specs and features, this particular model will once again be powered by Qualcomm’s Snapdragon 845. This time around though, it doesn’t sport 6GB of RAM or even 8GB of RAM at that. Rather, OnePlus has equipped this smartphone with a whopping 10GB of RAM. Additionally, while the battery capacity is expected to remain unchanged at 3700mAh, some significant improvements have been made to the Warp Charge tech. More specifically, this particular version is called Warp Charge 30 and can now provide “a day’s power in 20 minutes” according to the promotional posters. At the moment, OnePlus is expected to announce the OnePlus 6T McLaren Edition Speed Orange on December 11. While still unconfirmed, sales will reportedly commence in a number of countries that same day, although some markets may have to wait a bit longer to receive the smartphone. It needs to be 10gb because its an android. But this is so boring. Android can’t take the price of this. A junk coated with metal. You're not a very educated one are you, boy? No, not all. It also has 2GB more RAM. Hold only two more apps? Gosh that sounds stupid. The Note with 4GB held as many as 20 apps in memory. My Note 9 with 8GB has held over 30 apps in ram and I could have added more. Hating on a phone you aren't even gonna buy just because it runs Android? It holds it while during its current screen on time yes. Lock the screen, go back and check 30 minutes later. How many does it hold then. Not quite the same is it? It's not ur phone, it's android behavior.. Just saying. I'm not ranting anything, I am an Android user and I love android. I'm not blaming the OS here, I'm hating this new kind of "unique" bullsh*t niche that some OEMs try to sell today. Like this one for instance, OP6T is a hell of a phone, beautiful, fast, gorgeus screen, then they try to take it "to the next level" by seeling an "exclusive" device that only has a new paint job and 2 more gbs of RAM? For what? The "normal" 6T isnt just more than enough for any user to feel a fast, responsive and butter smooth OS experience? Does 2Gb more of Ram really make that difference on a day to day usage to justify a price bump and a "exclusive" device edition? When they will stop trying to catch up with Apple and their non sence prices? Why dont just try to make the best phone they can, with great materials and just try to make this tech reaches for the most people possible like the Nexus line was back then, or even from what OP stood on their arrival? What the hell is going on with the phone market today? They just seem to be selling gimmicks to try to cause a "noise" to they take profit on it. Its ridiculous. That what I'm hating. Star wars edition was way more beautiful. Not really digging this design. Maybe in hand will look better. 10 GB RAM? My PC is definitely green with envy, now. I don’t understand 10Gb? I know multi tasking but why does a iPhone need so much less? Isn’t texting, surfing, working on a spreadsheet, streaming Pandora..on m iPad. Isn’t that multi tasking? Not trying to get everyone pissed. Seriously. So does this mean the OP7 will have 3800 mah with 10GB ram and 3 rear cameras? Omg, look at this amazing phone. Can OnePlus ever cease to amaze me with the 6T?